Mt. Holly Mayor's Office: Craftstravaganza! This Saturday! May 2! There's a great post by Mr. Jalopy over at Dinosaurs and Robots called $upport Independent Business and Reject the Fakers that you would all benefit from reading. It is a case study around the corporate crapping on of Jenny Hart's Sublime Stitching by Urban Threads that demonstrates how corporations rip off individual artists and create shittier versions of fine goods to screw the consumer as well. Here's a killer Jalopy quote from a few years back. Everything you love, everything meaningful with depth and history, all passionate authentic experiences will be appropriated, mishandled, watered down, cheapened, repackaged, marketed and sold to the people you hate. 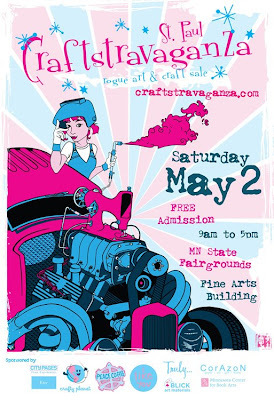 This Saturday, you have the chance to perk up your life wih some quality and style while perking up the pocketbooks of some great local craftspeople and artists at Craftstravaganza in the Fine arts Building on the Minnesota State Fair grounds.